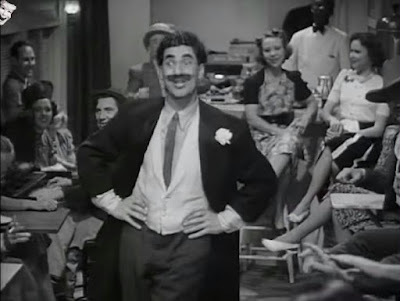 Jewish Humor Central: Throwback Thursday Comedy Showcase: Groucho Marx Sings "Lydia the Tattooed Lady"
Throwback Thursday Comedy Showcase: Groucho Marx Sings "Lydia the Tattooed Lady"
Today's throwback video goes back 77 years to the Marx Brothers movie At the Circus. In the movie, Groucho Marx sang Lydia, the Tattooed Lady, a 1939 song written by Harold Arlen and Yip Harburg.After it appeared in the movie it became one of Groucho's signature tunes. In 1950, Groucho famously 'stopped' trading at the New York Stock Exchange by commandeering a microphone and singing the song before telling jokes for 15 minutes, during which time traders suspended their work to watch him perform. The lyrics made many contemporary references to topical personalities such as Grover Whalen, who opened the World's Fair in 1939. The complex lyrics written by Yip Harburg with clever rhymes such as "Lydia/encyclopedia" and "Amazon/pajamas on" were inspired by W. S. Gilbert. Among the items, persons, and scenes tattooed on Lydia's body are the Battle of Waterloo (on her back), The Wreck of the Hesperus (beside it), the red, white and blue (above them); the cities of Kankakee and "Paree", Washington Crossing the Delaware, President Andrew Jackson, Niagara, Alcatraz, Buffalo Bill, Picasso, Captain Spaulding (Groucho's character in Animal Crackers) exploring the Amazon, Lady Godiva (with her pajamas on), Grover Whalen, the Trylon, Treasure Island, Nijinsky, Social Security Number and a fleet of ships (on her hips). And I thought I heard a reference to Mendel Picasso! Never saw this version, and never grow tired of the Marx Bros.